Are photos of ‘badass protester girls’ really so badass? Bojan is old. Old enough that when a Japanese architect came to reconstruct Skopje in the aftermath of the 1963 earthquake, Bojan was his interpreter. The Macedonian press were unsure what a Japanese person looked like, he said, and so one paper captioned a photograph of town planner and interpreter together with the wrong name under each. “They thought Japanese people must have big beards,” he said. The forest of tangled hairs enveloping his face is clearly not a product of retirement. Bojan is old enough to have been interpreter to Prince Philip - that’s the great-grandfather of newborn Princess Charlotte, for those readers with an interest in the goings-on/in/out of Kate Middleton’s uterus - when he paid a visit to Macedonia. The Queen’s husband is apparently a nice guy. They had pleasant conversations on a rowboat on Lake Ohrid. The point is, Bojan is old. He is of an age that we forgive the utterance of such “old fashioned” comments about pretty girls. He is also old enough to have seen and remembered a thing or two. The death of Tito, the collapse of Yugoslavia, the Macedonian conflict of 2001, the Ohrid negotiations which put a stopper in that conflict and on which he worked as an interpreter. He was also around in 1991, when independence was declared. I was years from leaving nappies in a bungalow in England, so I will have to take his word on the overnight transformation of Macedonian women. We were talking on May 7. It was my first full day in Macedonia having flown in late the previous night to cover the protest movement calling for the government’s resignation that continues to this day. One of the first things that had struck me about the movement before I even touched down was that nearly every photo of it that had gone viral was of women. Women linking arms as human shields for riot cops, women stood defiant in front of those same riot cops, a woman using a riot shield as a mirror to apply lipstick (that one even made BuzzFeed). That evening I attended the first of many protests. I informally canvassed opinion about the photographs. The women protesters I spoke to about the pictures saw them as empowering, they were glad to see other women being presented as strong figureheads. Women as heroes of the revolution, so to speak. I had wondered if anyone would find them problematic. After all, had the photos been of men doing the same things, odds are they would not have been viewed as quite so remarkable - with the possible exception of “the lipstick photo”. There is a sense of, “Look at that brave girl,” to the whole thing. And after all, mainstream Macedonian society makes no bones about a woman’s place. They are the country’s baby factories. A restrictive abortion law passed in 2013 has made terminating a pregnancy a bureaucratic assault course. Any woman wanting to have an abortion must first submit a written request to the health ministry outlining her reasons for terminating. She must then attend pre-abortion counselling designed to dissuade her. This is followed by a mandatory ultrasound, the notification of her husband, and finally a three day waiting period. If after all that she has still made it to termination, she is forbidden to have another abortion for twelve months. Showbiz also plays it part in reaffirming women’s role as babymakers. A weekly TV show airs on Macedonian television titled “It’s Time For a Baby”. The show is designed to goad couples into procreating. It does this by showing examples of couples who supposedly prove that any level of hardship or poverty can be endured so long as your offspring are plentiful. There are also financial incentives available to parents of large families. A survey conducted jointly by the United Nations and the Macedonian government in 2012 found 39.4% of women surveyed had experienced some form of domestic violence, most of it physical. In light of this, I had expected somebody to take issue with the way the popularity of these photos seemed to be, on some level at least, a reflection of surprise at Macedonian women’s capacity for courage. I did not find that somebody. I did, however, meet Jasmina Golubovska. 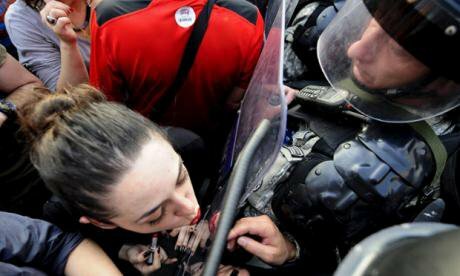 A political analyst at the the Macedonian Helsinki Committee, Golubovska woke to find herself BuzzFeed famous one morning after the website picked up the photo of her donning lipstick to kiss a policeman’s riot shield. What did bother her was that the photo was presented without context, “First of all, the whole story is not the lipstick and the kiss,” she said. The moment was captured on May 5, when protesters had taken to the streets outside the government. They were protesting the revelation that the ruling parties had, it seemed, deliberately first covered up and later lied about the death of 22-year-old Martin Neshkovski, apparently at the hands of a police officer in 2011. The protest soon descended into a protracted standoff between protesters and police. The front rows of both sides were virtually nose-to-nose, except for the reinforced plastic riot shields between them. Golubovska explained that inevitably the protesters started talking with the police, “We told them, ‘If you don’t want to join us, just move away.’” Of course the police did not. So, “We discussed how to soften them [the police] up. Then we started asking, ‘Who has some red lipstick?’” That person turned out to be Golubovska, so she asked the policeman in front of her if she could draw a heart on his shield. No, she could not. Well then, could she apply it to herself? She could. After doing so, she leant forward and planted a kiss on the shield. And thus the photogenic moment that put Macedonia’s protesters on the front pages of websites around the world was captured. But that lone moment did not show the whole story, according to Golubovska. There was, she said, a second photo taken showing the policeman waving a finger of admonishment at her after the kiss. Likewise, no news outlet carried photos of the policemen’s feet, which she said were kicking protesters’ shins underneath their riot shields. Whatever shortcomings the photo might have as a way of telling the whole story, it is undeniable that it delivered the protesters’ dissatisfaction with their government to a world stage. And it is hard to refute the utility of that. And Macedonia’s is not the first protest movement to go viral thanks to iconic photos of women protesters. In 2013, Turkey’s Gezi Park protests came to be summed up in a series of photos depicting a woman in a red dress being pepper sprayed. The following year in Bosnia, for many it was the tearful face of protester Lejla Kusturica pleading with police to abandon their posts that humanised what to the rest of the world was a series of photos depicting angry mobs and burning buildings. These photos all served a purpose. But in each case the purpose they were serving was to promote the cause of changing an unsatisfactory status quo. Could it be though, that by reacting so strongly to images of women protesters precisely because they are women protesters, the people sharing those images are in fact promoting that unsatisfactory state of affairs? None of the aforementioned protest movements were specifically about women’s place in society. Nonetheless, each took place in societies where women have a very specific place. The damage of any inequality is not limited to the specific group it overtly harms. The belief structures that underpin it spread much further. Might it be that in so feverishly sharing these images of impassioned women protesters we are inadvertently hindering the causes they were fighting for? Then again, perhaps the very fact of the photos is a reflection of injustice in the society that produced them. But if that is the case, is that not something we should talk about when we share them too?